Last week we had a little contest…. We are headed to market soon and wanted to know what you wanted to see in store. After we heard from everyone, names were thrown into a hat – we selected our winner! Miss Leah, congrats! 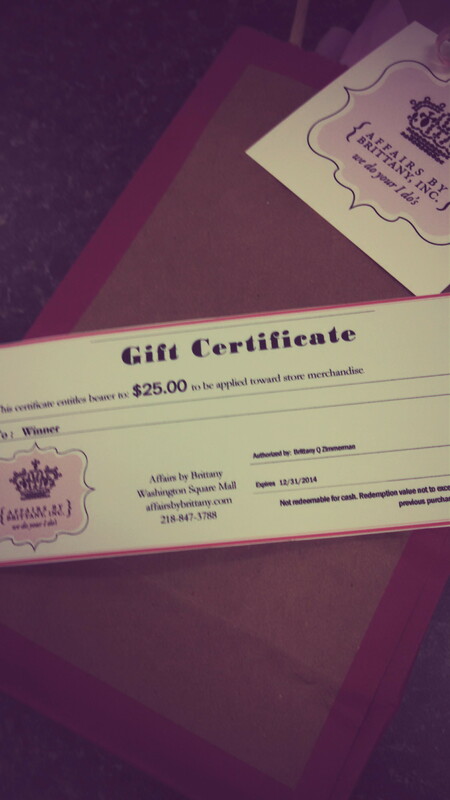 You won a $25 gift certificate. Thank you everyone for your feedback. We truly appreciate it. Stay tuned for all sorts of new goodies in the coming weeks and months. This entry was posted in Events, Newly Engaged, Planning and tagged Attire, Creative, Feeling good, Ideas, Looking your best, Planning, Preparing for the big day! by Affairs by Brittany. Bookmark the permalink.